EAST RUTHERFORD, New Jersey – February 2014 – For the 82,529 fans that braved forecasts of cold, snowy weather predicted for Super Bowl XLVIII on February 2, Bruno Mars and the Red Hot Chili Peppers delivered an enthusiastic show that was long on great musicianship and killer showmanship. And making sure that show also sounded great were a pair of DiGiCo SD5 digital audio consoles used for both front-of-house and monitor mixes. 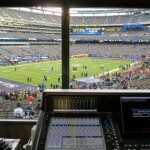 The SD5 used for the FOH mix was positioned at the NFC end zone end of the Met Life Stadium, the site of the 2014 Super Bowl between the Denver Broncos and Seattle Seahawks. The monitor SD5 console, meanwhile, was located in field-level suites underneath the stage, which was built into one side of the stadium. Between them, the DiGiCo SD5s filled the stadium with crystal-clear live sound pumped through 66 JBL VT4889 speakers and 32 VT4880A subwoofers. The two DiGiCo desks are part of a recent acquisition of six DiGiCo digital consoles — two SD5s, two SD7s, two SD10s and 14 full-sized SD I/O Racks, capable of delivering up to 192-kHz high-resolution analogue I/O converters and multiple digital formats, including MADI, AES and ADAT — by ATK Audiotek, which provided the live sound for the Super Bowl halftime show, as it has for the past 16 years. No stranger to live broadcast audio, the award-winning DiGiCo SD console platform has also been the choice for FOH and monitor mixing for many other high-profile televised awards programs, including the GRAMMY Awards and Billboard Music Awards. 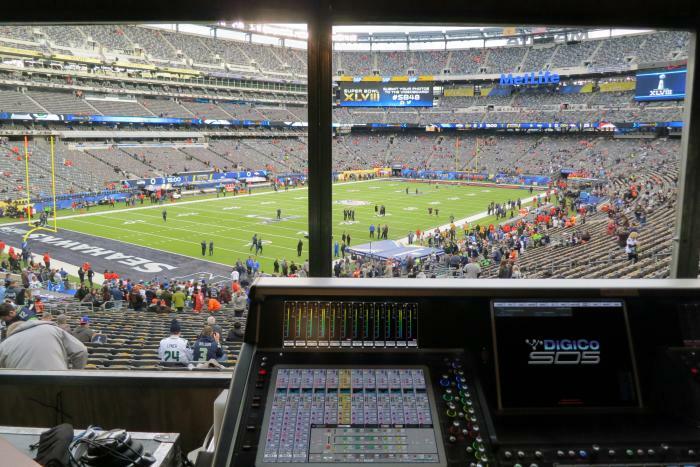 “The DiGiCo consoles performed fantastically,” comments Patrick Baltzell, sound designer and FOH mixer for this year’s Super Bowl halftime show and for 16 of the iconic events that preceded it. He mixed the live show for the stadium audience with the SD5 FOH console connected to a Mini-SD Rack, which held all of the I/Os for the live and recorded elements of the show, as well as for several key pieces of outboard processing, including four Empirical Labs Distressors used on vocals, an Izotope ANR-B adaptive real-time noise reduction hardware unit, a Dolby CAT-430 dialog processor, and a Lexicon PCM 96 digital reverb. However, the rest of the processing used for the live sound for the entire show was from the SD5 console alone, including all of the EQ, compression and gating for all of the performers and instruments.